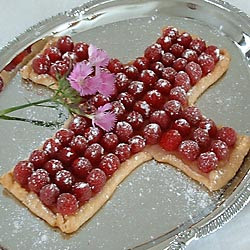 This semi-homemade dessert is not only delicious, but also memorable and symbolic for your Easter celebration. 1. Unroll pie crust onto baking sheet. Trim into large cross shape. Fold up every edge to form a mini 'wall.' Brush gently with milk. Poke with fork randomly to stop air bubbles from forming. Bake at 350 degrees for 15 minutes or until firm and golden. Set aside to cool. 2. Wash and dry berries. Set aside. 3. Pour juice into small sauce pan. Wisk corn starch into juice until dissolved. Bring juice to boil stirring constantly until thickened. Let cool 5 minutes. Stir and pour into cooled pie shell, setting a little aside. 4. Position berries in neat rows into glaze before it cools completely. Dust with powdered sugar. Garnish with flower. Serve with scoop of ice cream or creme fraiche and drizzle extra glaze on top. I love this idea! I think I may try this one. Thank you for posting this.